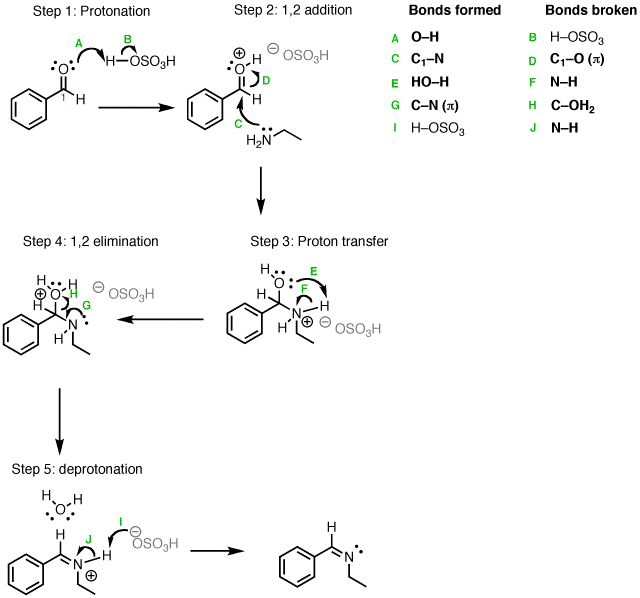 OK – so making amines through direct alkylation is generally not a great way to go. You could even say it’s crappy. So what’s the “right” way to do it? Here’s a more versatile way to make amines that doesn’t result in over-alkylation. Reduce the imine with a reductant such as sodium cyanoborohydride (NaBH3CN), sodium borohydride (NaBH4), or sodium tri-acetoxyborohydride (NaBH(OAc)3) giving a new amine. There’s no need to isolate the intermediate imine (which tend to be somewhat unstable anyway); the reduction can be performed in situ (i.e. in the same reaction flask) after giving the imine sufficient time to form. This process is called reductive amination. Say you have a primary amine such as benzylamine and would like to make N-methylbenzylamine. How do you do it? Direct treatment of benzylamine with an alkylating agent (e.g. methyl iodide, CH3I ) will result in significant formation of the undesired tertiary amine (i.e. di-alkylation). Yes, you could try and separate out the secondary amine that’s formed from the tertiary amine, but we’re not going to settle for 10-30% yields here. Separating mixtures is fine on paper, but (trust me on this) it can be a real a pain in practice. Is there another way to do it? While alkylation can happen multiple times on an amine, imines only form once on a given amine. Once the imine is formed, the C=N bond can be reduced, giving us a new alkyl group attached to nitrogen. This is a much more controlled manner of forming nitrogen-carbon bonds. After the imine is formed, it must be reduced to the amine. It’s possible to use the familiar reducing agent sodium borohydride (NaBH4) for this process. You may recall that NaBH4 is used for the reduction of aldehydes and ketones. There are two other commonly used reductants for reductive amination: sodium cyanoborohydride (NaBH3CN) and sodium tri-acetoxyborohydride (NaBH(OAc)3 ). For our purposes, they can be considered to be the same. In practice, NaBH3CN is a little bit better than NaBH4. Reductive amination is extremely versatile and can be used to install a large variety of different alkyl groups on an amine. The nice part is that the groups just go on once. What about ketones? They work too! Employing a ketone will result in a branched alkyl substituent on the amine. For example, using acetone in the following reductive amination gives an isopropyl group. 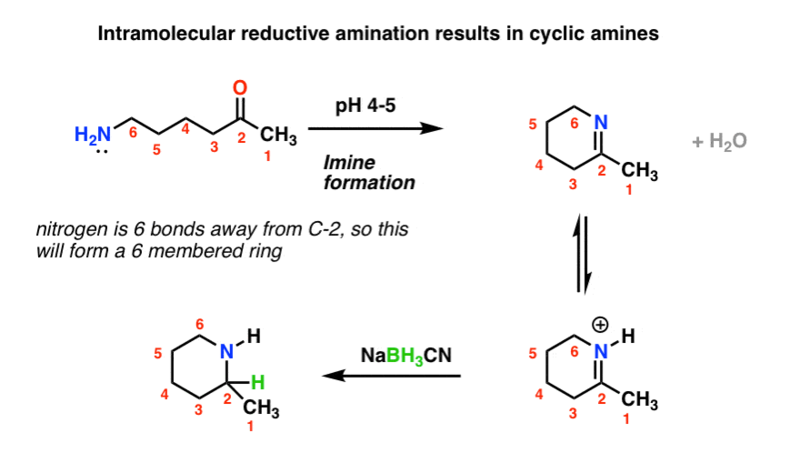 Another useful feature of reductive amination reactions is that two (or three if one starts with ammonia) reductive aminations can be employed in sequence. For example, look at the synthesis of the tertiary amine below. Importantly, the sequence of reactions isn’t crucial here. We could have done the first reductive amination with benzaldehyde first, and acetone second, and still obtained the same product. Finally, there’s the intramolecular case, which always seems to give students a headache. If a molecule contains both an amine and a carbonyl, then it can cyclize to give a cyclic amine. When drawing out the product of ring formation, I strongly advise counting and numbering your carbons. I’ve seen so many students make mistakes when redrawing that it’s well worth the time to double check that you haven’t left anything out. 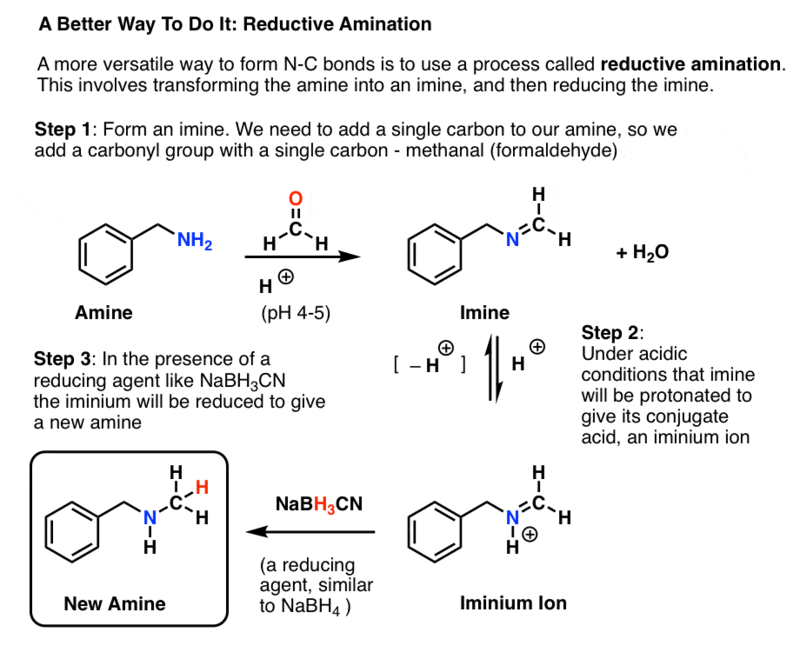 It might take some time to appreciate, but reductive amination is an extremely powerful way of making amines. It’s very helpful to be able to think backwards from an amine product to what the starting materials look like. Look at the following tertiary amine. It is connected to three carbons, which we can label a, b, and c. Each of these N–C bonds could potentially be formed through reductive amination, since they have C-H bonds. That means that there are three possible ways of making this amine through reductive amination, all of them acceptable! In short, reductive amination is a very powerful and useful protocol for the formation of amines. What about installing a phenyl group (see above)? For formation of bonds between nitrogen and sp2-hybridized carbons (e.g. alkenes or phenyl groups) or between nitrogen and sp-hybridized carbons (e.g. alkynes), reductive amination won’t work. Think about it. 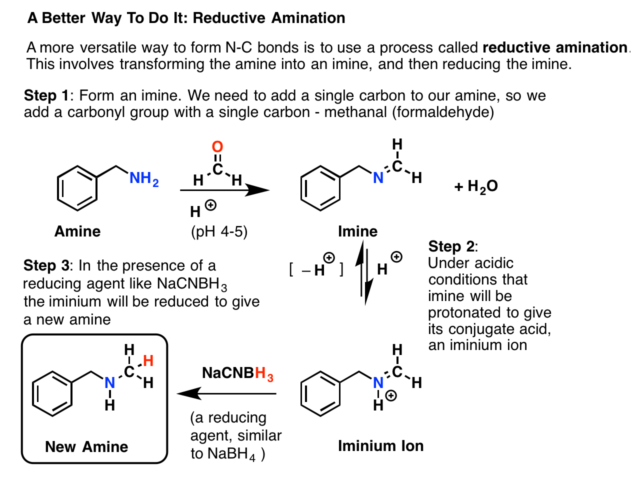 Note that the carbon attached to the nitrogen doesn’t have a C-H bond. Therefore we can’t work backwards to the reduction of a C=N bond with a hydride source. One must resort to alternative techniques. 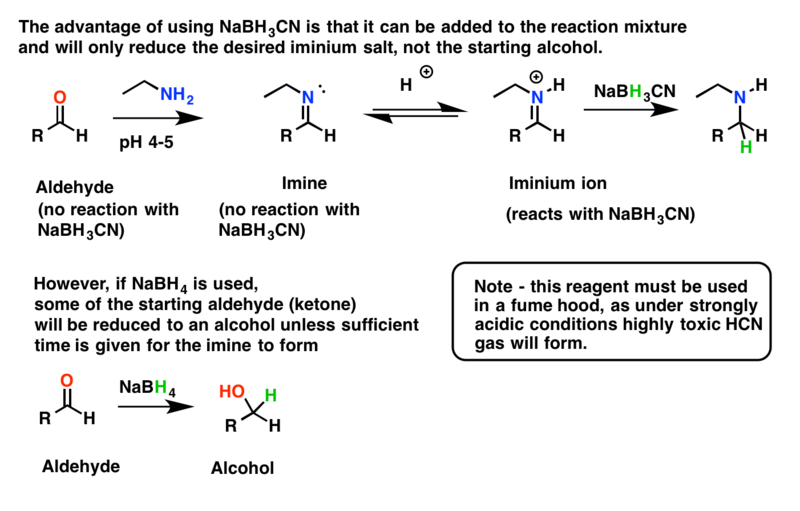 Buchwald-Hartwig cross coupling is one of them. NaBH4 can be a perfectly acceptable reducing agent for reductive amination. There’s one slight problem with this reagent, however. 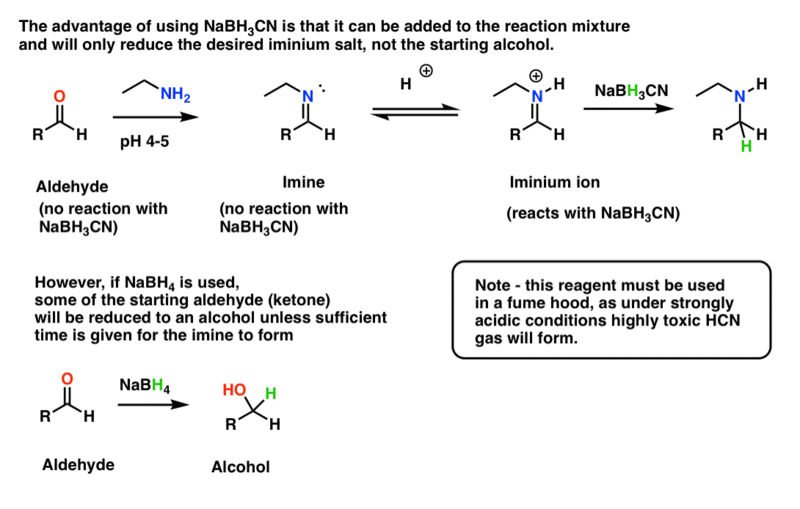 What if the NaBH4 ends up reducing the aldehyde or ketone before it has a chance to react with the imine? That would lead to lower yields. [In practice, this can be reduced somewhat by giving the imine sufficient time to form, and then adding in NaBH4. An even better approach involves the use of the slightly weaker reducing agent sodium cyanoborohydride (NaBH3CN). Why use a weaker reducing agent? Once the imine forms at pH 4-5, some of it will be converted into its conjugate acid, an iminium salt. The advantage of using NaBH3CN is that it isn’t a strong enough reducing agent to reduce aldehydes or ketones, but it is a strong enough nucleophile to reduce iminium ions. Therefore more of the starting aldehyde/ketone will be converted into the amine. [This is particularly important when working with very precious samples of aldehyde]. We are interested in reductive amination of secondary fatty amines to dialkylmethylamines with formaldehyde under hydrogen partial pressure, rather than solid reducing agents. Also of interest is direct conversion of primary fatty nitriles to dimethylalkylamines with DMA. This seems to be less well-described in the available literature. At industrial scale, conversions and yields above 95% are important. The condensed and thorough explanation on reductive aminations. Thanks! Glad it was useful to you Josh, cheers! How can be explained difffent reactivity of imine (iminium ion) between (protonated) carbonyl with NaBH3CN? The electrophile is the carbon, correct? And the more partial positive charge there is on that carbon, the better an electrophile it is, correct? Now draw the resonance form for the imine where you move the pair of electrons in the C-N pi bond to the nitrogen. Next, draw the conjugate acid (iminium) and do the same. Which resonance form do you think will be more stable between the two? Therein lies your answer. Bottom line, protonation of the nitrogen results in a greater contribution from the resonance form where there is a positive charge on the carbon, and it’s more electrophilic. In the table under “Applying Reductive Amination”, the benzaldehyde shown in “aldehyde to use” has an extra CH2. Can LAH reduce imines to amines? 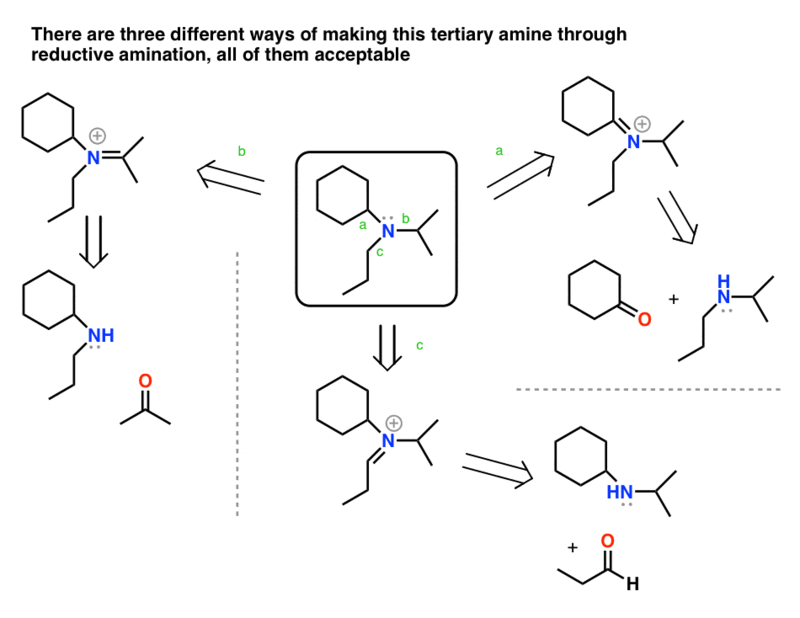 I learnt that usually, excess amine must be used while carrying out reductive amination. Is this to increase the yield of the imine? If yes, then would using excess of aldehyde/ketone also work? Hey Britney – you want to use excess to make sure that the amine has a chance to react with all of the aldehyde/ketone first, before adding your hydride source. Once the hydride source is added any aldehyde/ketone that remains will be reduced to an alcohol rendering it useless for the process. Doesn’t the section “Sequential Reductive Aminations” contradicts with the statement that “While alkylation can happen multiple times on an amine, imines only form once on a given amine”? Ah. Yes, I see the source of your question. Maybe I should have written, “in the same reaction vessel”. During the course of an alkylation reaction, an amine can be alkylated, and then that product can be alkylated again. So when you go to try an isolate the product, you may find that multiple alkylations have occurred. In reductive amination, imines will only form once in the same reaction vessel, and once they’re reduced, that’s the end of the reaction. Only one new C-N bond will have formed. 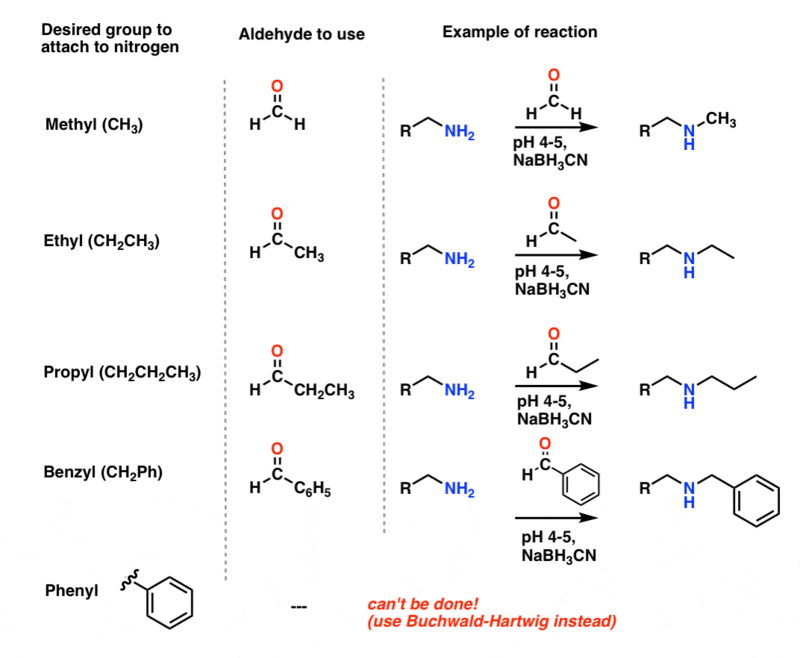 Now, once you’ve isolated and purified the product, if it’s a primary or secondary amine there’s nothing stopping you from doing a *second* reductive amination with a different aldehyde. It would be awsome to have a few references as well. I am especially interested in the NaBH3CN part. The pka of a protonated amine is 9-12, whereas the pka for a protonated carbonyl is -6 or thereabout. Hence in a mildly acidic solution the carbonyl won’t be appreciably protonated at all in comparison to the amine. The first step of this mechanism is amine addition to the carbonyl. The mild acidity serves to rapidly protonate the oxygen after addition of the amine and facilitate proton transfer for the removal of water. At least that’s how I understand it. It’s been awhile since phys org. Most texts get this wrong as well. I love your cite, awesome resource for teachers and students! Thanks for this, I’m adding it to my correction queue! Although I may be mistaken, I see pKa’s of protonated carbonyls at about -2 or so. Still, that’s about 15 orders of magnitude to traverse, so you’re correct on this point.